I knew Jim Lovell and the crew of Apollo 13 returned safely to Earth, but Ron Howard’s movie had me on the edge of my seat nonetheless. I knew that not all of the POWs got home safely during The Great Escape, but that didn’t keep me from investing enough in the characters that I hoped they would. I knew that United Flight 93 went down in the field in Shanksville, Pennsylvania, on September 11, 2001, but Paul Greengrass’ movie still had me rooting for the passengers to get into the cockpit, kill the terrorists, and pull back on the yoke in time to save the plane and themselves. When a movie can cause that suspension of reality, getting you to forego history just long enough to involve you in the tension of the moment, it’s quite an accomplishment. 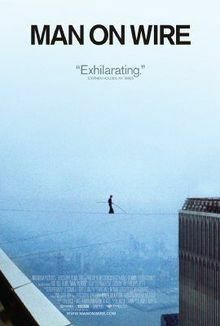 Add to the list of movies that do so — and to my Movies You Might Not Know list — a documentary from earlier this year entitled, “Man On Wire.” It is about Phillipe Petit who, in 1974, suspended a cable between the tops of the twin towers of the World Trade Center and walked between them, as if suspended in mid-air. The film includes interviews with Petit and his co-conspirators, with footage shot during their secret deliberations and preparations, plus re-enactments of the plot as they pulled it off disguised as businessmen and contractors to gain access to the buildings. It is presented with a benign undercurrent that made me question whether they’d be able to finish the job, despite being firm in the knowledge that they did. There’s also a marvelous clip towards the end from a press conference the day of the incident, in which one of the NYPD officers who went to try to get Petit down off his wire, confesses that he knew at the time that he was seeing something he’d never see again, and was getting a kick out of it. That’s what makes “Man On Wire” special. Petit’s time in the spotlight lasted slightly longer than the 45 minutes he spent alone in the air that day. The movie returns you to that period, when the towers still stood tall — when a French wire-walker viewed them not as a target for terrorism, but as a palette for his art.